(Bloomberg) -- China and New Zealand signed agreements on eliminating double taxation and tax avoidance as the two countries look to shore up relations following a series of incidents that cast doubt on the strength of their economic partnership. President Xi Jinping welcomed New Zealand Prime Minister Jacinda Ardern at the Great Hall of the People in Beijing, with the two leaders pledging to improve ties strained by U.S.-led efforts to block Chinese telecommunications companies from next-generation networks. Ardern earlier met with Premier Li Keqiang, signing memorandums of understanding on agricultural cooperation, bilateral financial dialogue and science and research cooperation. Ardern’s first visit to China as prime minister comes as her global profile grows in the wake of a mass shooting -- modern New Zealand’s worst -- that left 50 people dead and prompted her to overhaul the South Pacific nation’s gun laws. A longer visit had been planned, but shortened to just a day following the attack, she told reporters last week. “My choice to proceed with the Beijing leg of my visit does reflect the value New Zealand places on its relationship with China, and acknowledge that you too have seen the strength of that relationship through the fact that we are here meeting in spite of those circumstances in New Zealand,” Ardern told Xi on Monday. 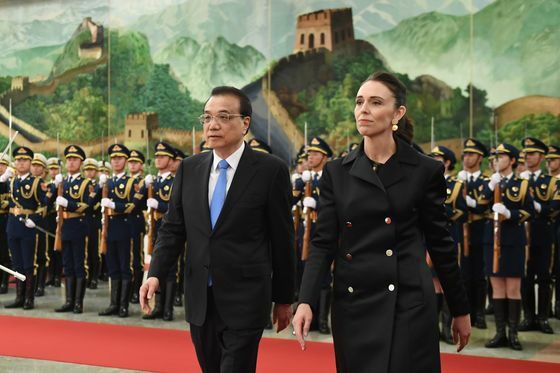 New Zealand has been pushing to upgrade its free-trade agreement with China for some time, something Ardern was expected to raise during her visit. The renegotiation began two years ago. New Zealand has also been a focus of Xi’s growing campaign for influence in traditional bastions of U.S. support in Asia-Pacific. China’s Foreign Ministry said last week that it hopes her visit strengthens bilateral trust and expands cooperation between the two countries. New Zealand’s opposition politicians have called for a re-warming of relations with China in order to avoid severe economic consequences. Xi said he wanted to continue the trend of “striving to be first” with New Zealand, citing the country’s status as the first developed Western nation to sign a free-trade deal with China. Ardern’s visit “sends a positive signal that top officials from both countries are staying in contact to solve major disputes. Communication in the tourism and culture sectors is getting back to normal,” Wang Jiazheng, chief representative of the Guangdong Economic and Trade Representative Office in New Zealand, told China’s state-backed Global Times this weekend. China is New Zealand’s most important trading partner, with upwards of NZ$27 billion ($19 billion) in two-way trade last year. Despite their economic ties, a series of incidents this year has triggered concerns of friction between the two countries, after Ardern’s government blocked embattled Chinese tech giant Huawei Technologies Co. from its next-generation 5G wireless network. Along with neighboring Australia, New Zealand is a member of the Five Eyes, an intelligence-sharing partnership that includes the U.S., U.K. and Canada and looks at trends including global concerns about China’s activities, particularly espionage and cyber penetration. In comments made to reporters before her meetings in Beijing and streamed by New Zealand’s 1NEWS, Ardern said reporting that Huawei had been banned in her country was untrue. “It will be helpful for me to explain that process and the fact that there has been some misreporting,” she said, adding that New Zealand makes it decisions independently of other Five Eyes nations. “I expect that some of the issues we have talked about here -- cyber security -- will come up,” she said. Delays in Ardern’s China trip -- originally planned for late last year -- fueled concerns, along with the postponed launch of the China-New Zealand Year of Tourism, claims that some exports faced clearance delays at Chinese ports and a Chinese media report that tourists were canceling visits to New Zealand. Government-controlled Air New Zealand was forced to redirect a flight to Shanghai last month -- apparently because paperwork included a reference to Taiwan. Beijing has demanded that global businesses refer to Taiwan as Chinese territory.